If the Darkstars achieved their goal of eliminating violent crime, do you think they’d all have to look for new jobs? I’d think any QA department for most manufactured goods would suit them well, and they’d probably make good high school principals too. The rest of them could be welders, since they’ve got the helmets for it. 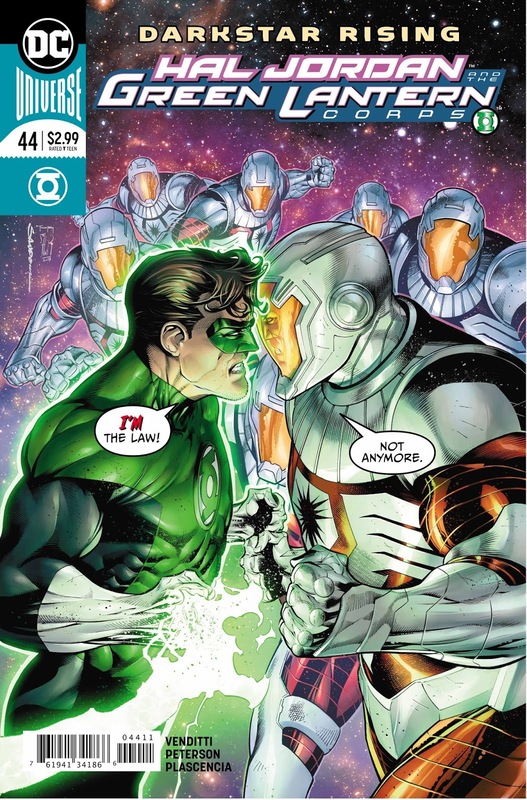 Please enjoy my review of Hal Jordan and the Green Lantern Corps #44, right here! Eric called it on the podcast: this issue opens with Tomar-Tu coming to Earth in his Darkstars suit, to kill Goldface, who murdered his father much earlier. 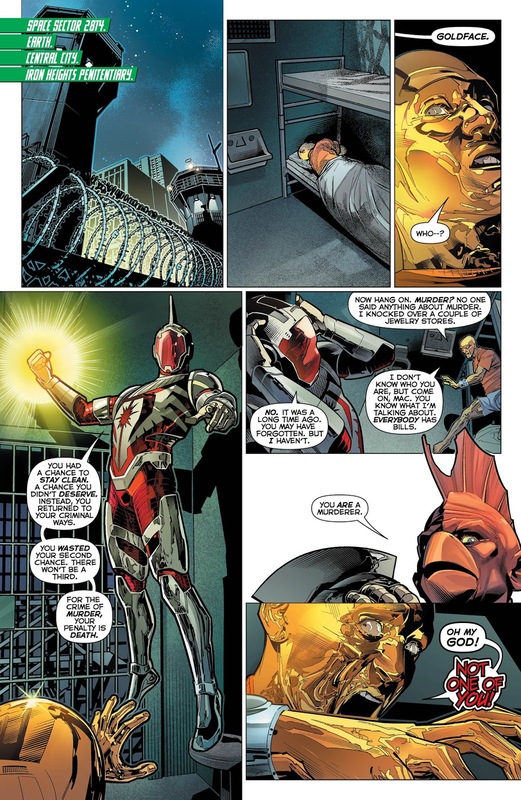 Hal shows up to Iron Heights after Goldface has already been turned into a skeleton, which gives him an opportunity to gab with the Flash for a while. This is something I really enjoyed seeing, even though I wouldn’t say it was full of camaraderie, just having Hal interact with another member of the Justice League in this book felt good. 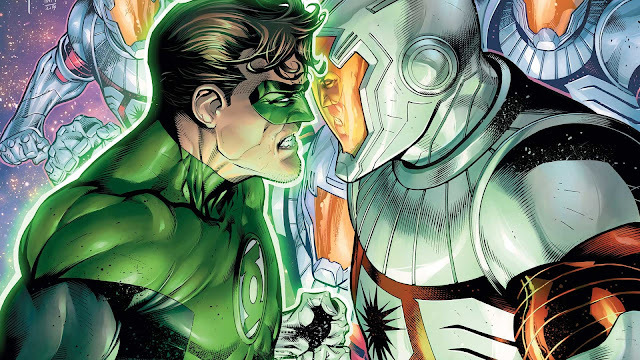 Hal isn’t even on Earth to deal with Goldface or Tomar-Tu, however, he’s here as part of the Green Lantern Corps’ initiative to recruit bad guys to fight the Darkstars—and Hall is looking to get Hector Hammond involved! 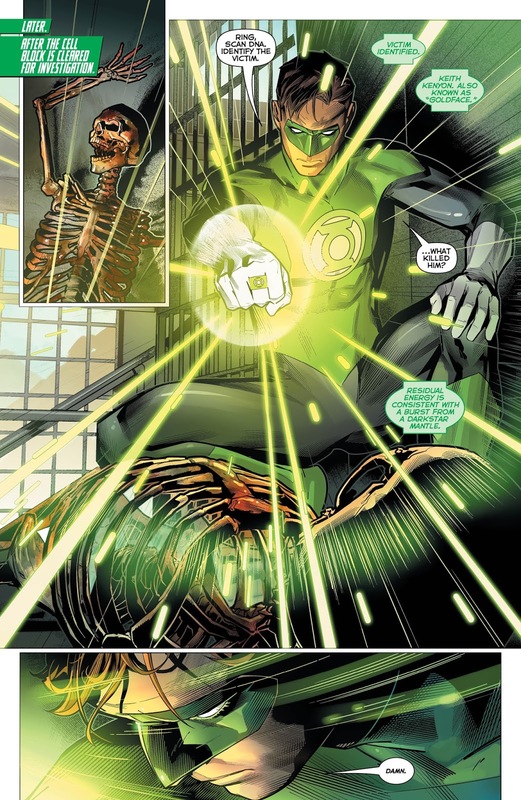 Though that’s a reveal at the end of the book, so let’s check out what the rest of the Lanterns are up to. Guy is dressed in a t-shirt emblazoned with a “W” from his old Warrior logo and a leather jacket and pants when he visits a seedy bar on the planet Heep. He’s well-known there, as evidenced by the aliens that back away quickly from his boisterousness, and this is likely because he has a standing monthly appointment there to catch up with his old Sinestro Corps buddy Arkillo—a meeting that’s been scheduled for “immediate” because Guy recruits Arkillo to fight the Darkstars. On a tip from Guy, Kyle finds Space Cabbie, who then takes him to New Genesis, where Kyle swears he and Orion are tight—yet they open fire on Space Cabbie when he materializes in their space! Maybe it’s because his engine is using stolen Motherbox technology? John goes right back to planet Jekku to recruit Zod, and he’s much more compliant because John remembered to bring Kryptonite with him this time. He even breaks Zod’s wrist! Meanwhile, on Earth, Hal tries to get Hector Hammond back in action from his Metropolis Police-induced drug coma, but he’d thwarted by one of their officers—Atomic Skull! Yeah! Probably the best thing from the Superwoman series was Atomic Skull on the MCPD, and I loved to see it here. I also liked Guy’s scene at the bar and his interacting with Arkillo. The rest of the issue I was fairly lukewarm about, though its implications—a force including Orion, Arkillo, General Zod and Hector Hammond is definitely something I’d like to see. Unfortunately, we’ll just keep waiting for it as this story plods along its six-issue arc like all the others. I’d like to take a moment to discuss the work of the art team, Brandon Peterson and Ivan Plascencia: it is absolutely exemplary. Every page is thrilling to look at, which, for three bucks, isn’t too bad. I just wish the story would catch up to the visuals sometime. Our Core Four go on their bad guy recruitment drive, and you might be surprised by the folks they've picked for the team! Biggest star of this show is the artwork, which is spectacular. This series really does have some of the best rotating art squads in the business. And I'm actually excited for next issue. Had a feeling that Guy was going to find Arkillo for help. Wouldn't be surprised if a twist comes along saying that the Darkstars have already meet with Soranik and the Yellow Lanterns for an alliance. Hmm...that would be something. 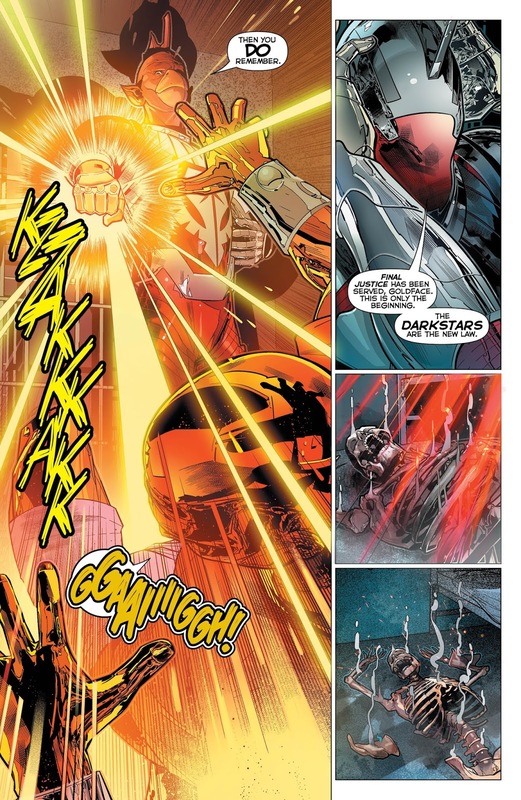 But wouldn't the Sinestro Corps be "executable offenders" according to the Darkstars?